I was reminded of the above graffiti, which is on a bridge over the M25. This is the motorway that circles greater London. The 'artist' must be a John Lennon enthusiast, though perhaps not too hot educationally. 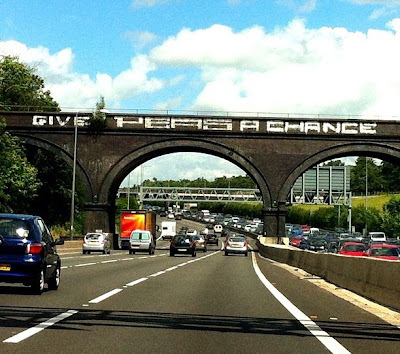 The slogan reads: 'GIVE PEAS A CHANCE'. Of course he may have been a vegetarian pleading to give certain vegetables a chance - in this case peas. 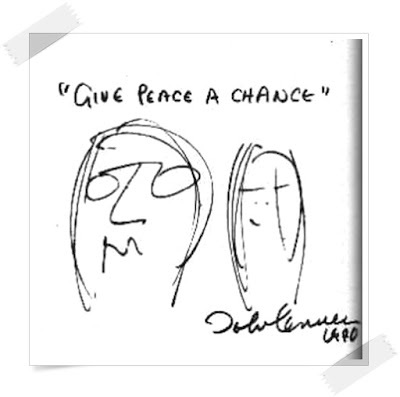 In these times though it would be good to think that the message 'Give Peace A Chance' as per John Lennon's sketch is still very relevant - and that we should all actually give it a go. Going back to peas, they also have their fans too. There is an annual 'Peasenhall Pea Festival' in the English village of Peasenhall, Suffolk which attracts hundreds of visitors every year. They have events such as Pea Shooting, the World Pea Podding Championships and a National Pea Eating competition. In 2012, the Pea Festival had an OlymPEAn theme, celebrating the London 2012 Olympics. 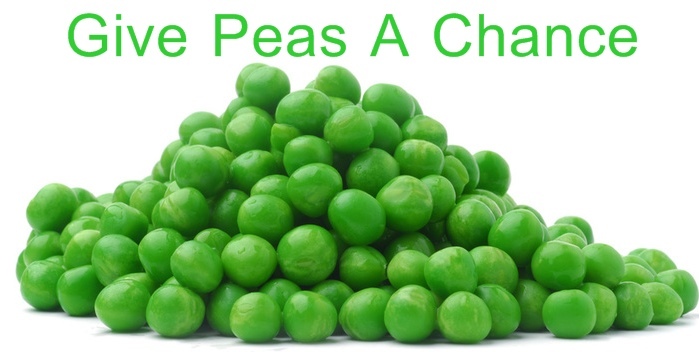 Maybe we should therefore give both peace and peas a chance. Food for thought. 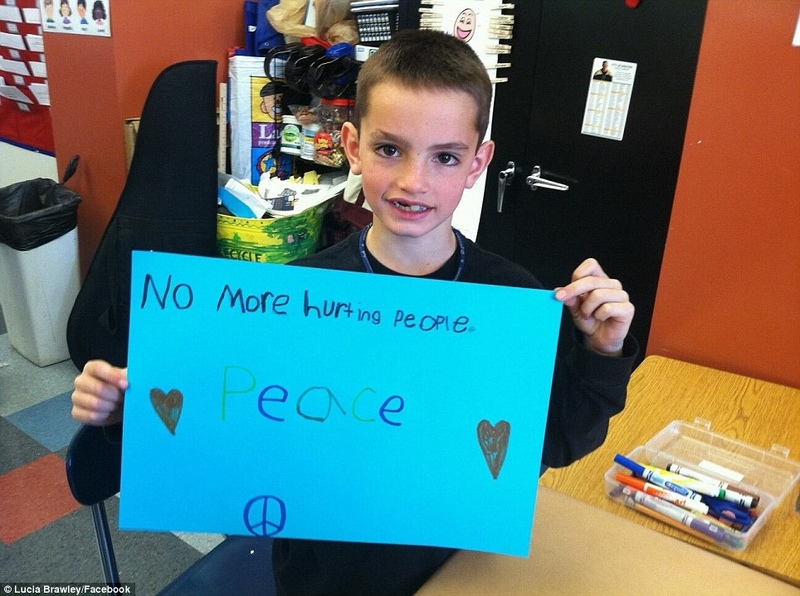 And a poignant final photo. The above post was written a few days ago and in today's newspaper I saw this picture of the young boy, Martin Richard, who was killed at the Boston Marathon. He's holding a peace sign. I think this says it all. And I like reading your poems too. Yes, yes, yes let's give peace a chance. I don't get all this nastiness in the world. Spread the message Mike. There does seem to be a lot of hate about - look how some people reacted to Thatcher's death. Being a misspelling may get more noticed than if it was spelt properly. Actually Mike there is also another connection here in this post. John Lennon was from Liverpool and the Hillsborough tragedy was remembered on the 15th April the same day the Boston Marathon was run. The owner of Liverpool FC also owns the Boston Red Sox baseball team. The Red Sox all wore the number 42 that day because it was also Jackie Robinson Day on April 15th was well. I didn't comment but I did read your post about Liverpool FC and the sports tragedies. Checked out the bridge you mention below - thanks. Lennon would probably be appalled at how fragile peace still is. Love the sign! I'm sure you are right. Wonder how Lennon would have reacted to life today?
" Marcia McMahon – Channel for John Lennon, George Harrison, Princess Diana and more….."
And this episode really lived up to the Radio show's name...I don't think you could get more out there than this poor deluded lady. "were channeled by John" was almost too much for me to take.